Indulge in the seasonal bounties of fall at some of New York City’s most anticipated new openings downtown along with some of our favorite hotspots. 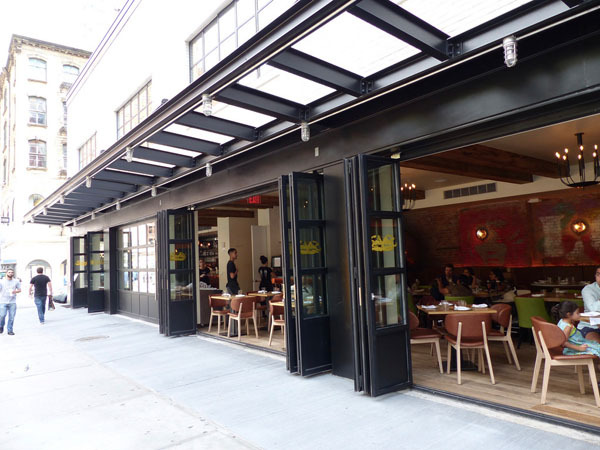 Located in the chic neighborhood of Tribeca, this location is the newest addition to the global restaurant group, reigning in as number 11 in the city. Part of The Frederick Hotel, this sophisticated yet relaxed and easygoing Italian eatery has two floors, allowing for both semi -private and private affairs as well as an outdoor patio that is perfect for people watching. The atmosphere at Serafina Tribeca has bright, colorful art and exposed brick walls that reflects the artsy and industrial vibe of the neighborhood consisting of edgy boutiques, galleries and artisanal coffee shops. 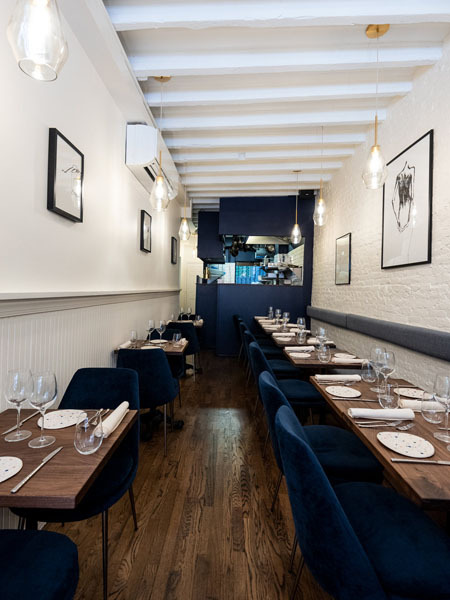 Founded in 1995 by Vittorio Assaf and Fabio Granato, Serafina has grown to be a New York staple attracting A List celebrities to families who come for their consistently delicious pastas, pizzas, and Italian fare. While everything is delectable, standouts from the menu include the mouthwatering black truffle pizza, filet mignon carpaccio with black truffle, imported Italian burrata, heart shaped lobster ravioli, and Veuve Clicquot and truffle risotto, and pan seared scallops with truffles and a celery puree. As Italians love to celebrate life, Serafina is a perfect example of la dolce vita! Papilles, French for taste buds, is a French farm-to-table restaurant located in the East Village that is redefining fine French dining with a creative/modern menu they call “cuisine vagabonde.” As one of NYC’s rising young talents and Daniel alum, French native Chef Andrea Calstier and his team are serving unforgettable flavors that will have your taste buds yearning for one more bite. Diners also enjoy specialty cocktails created by mixologist and co-owner Nicolas Thoni, that are made with fresh seasonal ingredients, such as fresh spices, herbs, and flowers that reflect those of the menu. 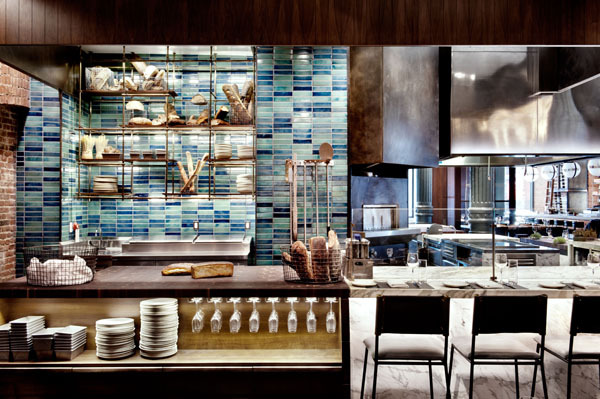 Known for their exciting program of rotating chefs, at Chefs Club New York the menu is never the same. 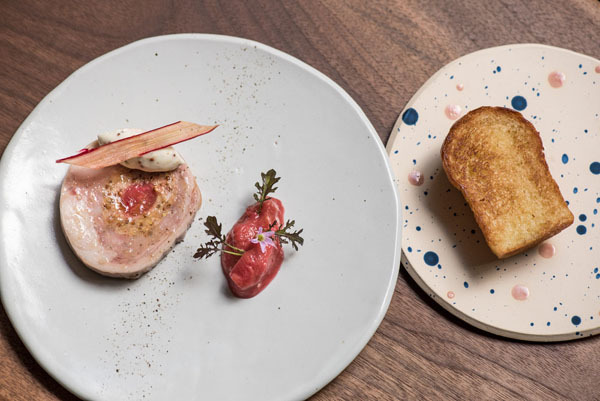 Belgian entrepreneur Stephane De Baets created this game changing restaurant concept that brings the culinary stars to the center stage allowing New Yorkers to experience masterpieces created by some of the most famous chefs in the world. Since 2012 nearly 200 celebrated chefs from around the world have cooked here including Alain Ducasse, Emeril Lagasse, George Mendes, and Jacques Pepin to name a few. Now through October 13, the latest chef to join the illustrious roster as a chef in residence is Abraham Conlon, Co-Owner of the popular Chicago staple Fat Rice. Since its launch in 2012, this casual eatery founded has developed a cult following. Conlon’s unique dishes are inspired by the modest traditions of Macau infused with exotic ingredients and global flavors from China, Portugal, India, and Southeast Asia. Conlon’s specialties include the beef ambilla- a pork shoulder roast with tamarind and curry, braised octopus with piri piri and cinnamon, chili prawns, and cavala salgada- a marinated and torched Spanish mackerel with hints of chili. Additionally, their current private dining room will be transformed into a pop-up of Conlon’s popular Chicago- based lounge Ladies’ Room. This intimate craft cocktail lounge is inspired by the fan tan (Chinese gambling halls) and red-light districts that proliferated around Macau in the mid-19th and 20th centuries that will transport you to another world. Sunday has become the official fun day thanks to the new Brazilian inspired party, Sarau, at the Hotel Chantelle rooftop that is a welcome sendoff to an epic weekend in the city. Sarau is traditionally defined as a cultural, musical or sporting event where people unite to express themselves artistically. Hosted by Wilson Henrique, this high energy dinner party is held alfresco in warmer weather and features live music from the Brazilian Brothers Band who play a mix of Brazilian hits and American covers, and rotating DJs- Eric Abobo, Alex Carioca, and Bruno Goiano that play in between and after the bands’ sets to keep the party going. Make a night of it and indulge in the playful and inventive creations imagined by Executive Chef Seth Levine. Standouts from the menu include the tuna poke cigars with sushi grade tuna in crispy wonton shells, crispy fish tacos, stellar seared diver scallops with maple glazed bacon on a pork skin chip, and crispy buffalo cauliflower served with hot sauce and bleu cheese. Complement the menu with a potent specialty cocktail such as the spicy smoked earth- mezcal mixed with poblano, celery & bbq bitters, or the friend of the devil with tequila, beet and jerk bitters. 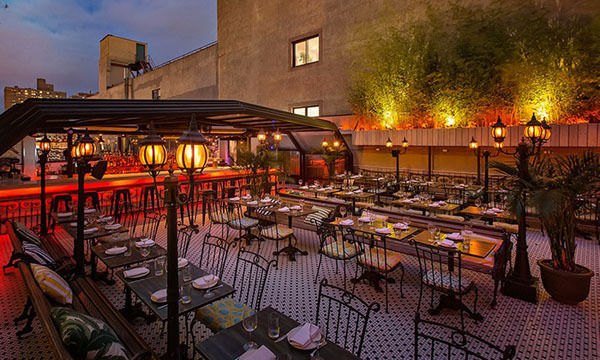 The party begins at 7:00pm, with Hotel Chantelle’s full dinner menu available until 10:00pm and ends at 11:30pm. 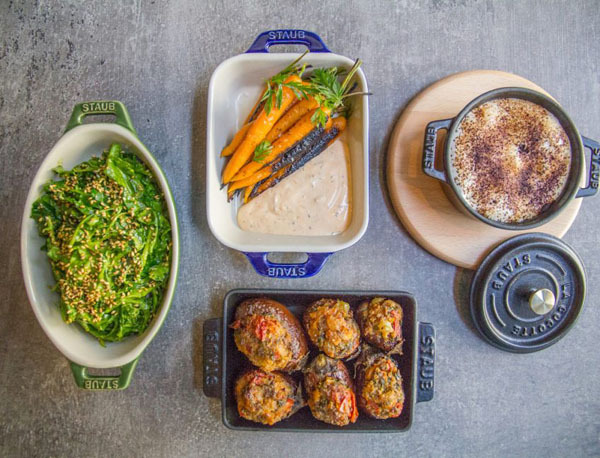 Located in the historic Financial District in the Andaz Wall Street hotel, Andaz Kitchen & Bar is creating food that reflects not only Executive Chef Pietro Consorti and his international team but also the diverse residents of New York City. Diners can expect to taste flavors inspired by Italy, Jamaica, Dominican Republic, Philippines, Vietnam and the United States, amongst other countries and cultures. Serving breakfast, lunch, happy hour, and dinner, the restaurant is creating nothing less than authentic cuisine made with fresh and seasonal ingredients. Chef Consorti features daily international specials in addition to the regular menu. Some of the signature dishes include a Mediterranean inspired handmade Ravioli with ricotta, anchovies, red peppers, parsley and Parmigiano Reggiano, the Kentucky-inspired Bourbon Mash Risotto with roasted corn, barley, malt, smoked blue cheese, ash and saba, or the Philippine inspired Chicken Adobo, served with bok choy and garlic fried rice. 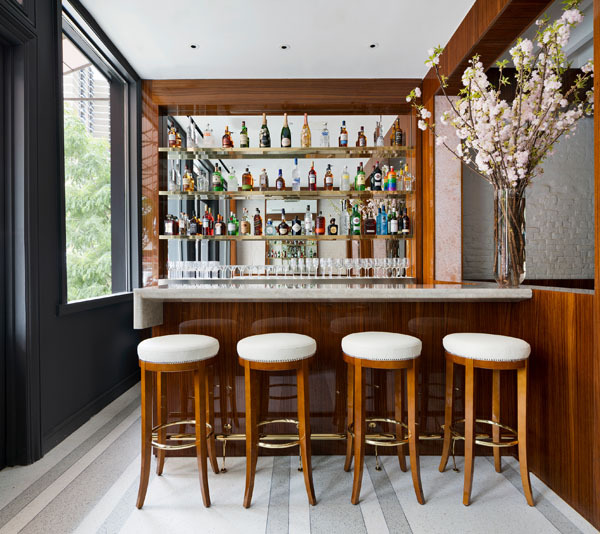 The fun “mixologist-crafted” cocktails and drinks pay tribute to the FiDi neighborhood with cocktails such as The Merger or The Intervention. This is a welcome addition to the cultural renaissance happening in the thriving FiDi and Seaport districts. As the entire Seaport area is experiencing a cultural renaissance, the glamour of Italy has come to Peck Slip. The newest addition to this hotspot district is the luxury boutique hotel, Mr.C created by Maggio and Ignacio Cipriani, the 4th generation brothers of the famed family. Located inside the hotel on the corner or Peck Slip and Front, is Bellini which brings a modern approach to rustic Italian cuisine. Named after the signature cocktail that has become synonymous with the Cipriani name, the restaurant concept is inspired by the jetset ambiance of Portofino, Venice, or Capri with a fashionably chic crowd to match. The dining room pays homage to the historic details of the building with natural light streaming from the large bay windows and soft pink hues accenting the understated elegance of the space. Authentic Italian Solimene ceramic plates serve rustic Italian dishes such as tagliolini with zucchini and scampi, spaghetti with sea urchin, dressed lobster, and branzino with tomato concasse. Save room for a decadent ending with tiramisu, ricotta cheesecake, or chocolate mousse that will make you feel like you are in Italia.